Have you ever noticed that hopeful people are happy people? Hopeful people seem to be able to easily enter into the rest of God. They have joy and peace. Do you want that for yourself? 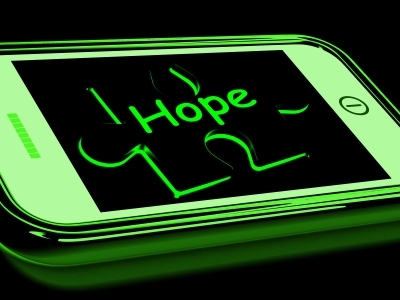 If so, hope is imperative. That’s why I want to talk about the importance of hope and how to maintain your hope in difficult times. This is the first of a two part series that I hope will encourage and bless you. First of all, let’s answer this question: What is is hope? Hope is a positive expectation that something good could indeed happen. You might ask, what is the difference between hope and faith? Hope and faith are indeed two different things, and both of them are choices we make. Hope says, “This could really happen.” Faith says, “This is going to happen.” Hope keeps the door of possibility open. Unbelief which results in discouragement and despair, closes that door. So hope is very important because it is a precursor to faith, and without faith, it’s impossible to please God. Secondly, why is maintaining hope important? If you lose hope, you will lose faith. A loss of faith will cause you to give up on your dreams. The Bible says in Proverbs 13:12 (NLT), “Hope deferred makes the heart sick, but a dream fulfilled is a tree of life.” Not only will it make your hearts sick with depression and discouragement; a loss of hope will cause you to give up way too soon. If you lose hope, then you’ll never get to faith. No hope, no faith. No faith, no results. Therefore, maintaining hope is of the utmost importance. Magnify God through worship. Worship helps you to put obstacles in perspective. If you are going to keep hoping, you have to have the right perspective about God’s power and ability. Worship allows you to catch a glimpse of Who he really is and what He is able to do so that your hope will remain intact. Read the scriptures regularly. Romans 15:4 says, “Whatever things were written before were written for our learning, that we through the patience and comfort of the Scriptures might have hope.” Renewing your mind with scriptures is a necessity. You must be convinced of what God has said about your situation. Listen for the Spirit’s voice and follow instructions. Proverb 3:5 tells us to trust in the Lord with all our hearts, stop trying to figure things out, and the Lord will guide and direct us. When God gives you an instruction, quickly obey. When you procrastinate or fail to move out at God’s command, inertia will fuel hopelessness. Confess hope. Hebrews 10:23-25 says, “Let us hold fast the confession of our hope without wavering, for He who promised is faithful.” Therefore, when you are losing hope, say out loud, “Lord, my hope is in you. I am going to keep my hopes up. I’ve been waiting a while, but this could still happen.” Life and death are in the power of the tongue (Proverbs 18:21). Hang around hopeful people. I Corinthians 15:33 says, “Bad company corrupts good character.” If you want to stay hopeful, surround yourself with people who are hopeful about the future. If you are in the company of negative, hopeless people, their attitude will eventually rub off on you. Find a reason to hope. I Peter 15:3 says, “But sanctify the Lord God in your hearts: and be ready always to give an answer to every man that asketh you a reason of the hope that is in you with meekness and fear.” Why should you keep hoping? Because you’ve nothing to lose by keeping hope alive, and you’ve everything to gain. Furthermore, everything is subject to change but the Word of God. Those are two very good reasons to keep on hoping. Look for the way your situation is advantageous. Ask God to show you how your situation is working for your good (Romans 8:28). Just because things appear to be getting worse, doesn’t mean they will stay that way. For example, Jesus let Lazarus die so that God could get all the more glory (John 11). Therefore, search out possible positive outcomes and perspectives that will help you to keep on hoping. Use your imagination. Imagine vividly in your mind what you want to happen. Think about your situation right now, and imagine that God has worked it out for you. How do you feel? Peaceful? Joyful? Why? Because hope came alive in you. Therefore, use your imagination to fuel your hope. In the next post I will give you more tips for maintaining hope in difficult times. Until then, be determined to be hopeful. Do not let the devil steal your hope. Keep on hoping and believing in God. He deserves that because He has been so faithful. Choose hope, believe God, and you will be able to enter into His rest. Have you had a time in life when you kept hoping and God gave you the victory? Please leave a comment below. Although the fig tree shall not blossom, neither shall fruit be in the vines; the labour of the olive shall fail, and the fields shall yield no meat; the flock shall be cut off from the fold, and there shall be no herd in the stalls: Yet I will rejoice in the Lord, I will joy in the God of my salvation. The Lord God is my strength, and he will make my feet like hinds’ feet, and he will make me to walk upon mine high places. God’s Word prepares you for victory. One of the reasons why God gave us Habakkuk 3:17-19 is to prepare us and show us how to obtain victory when we go through manifold trials or “divers temptations” (James 1:2). Every child of God can expect to go through the test of turbulent times such as Habakkuk described. Jesus said in John 16:33, “In the world ye shall have tribulation.” I Peter 4:12 states, “Beloved, think it not strange concerning the fiery trial which is to try you, as though some strange thing happened unto you.” You may face times when everything appears to be going down all at once. But if you prepare to have the proper mindset and decide what your response will be beforehand, you will gain the victory in difficult times. God is looking for a specific response. In the face of economic disaster, Habakkuk gave God an uncanny response. In spite of everything going wrong that could possibly go wrong, Habakkuk writes in verse 18, “Yet I will rejoice in the Lord, I will joy in the God of my salvation.” Thus, when everything is falling apart, the response that God wants to see is REJOICING in HIM. Rejoice in who He is. If many trials come your way all at once, don’t make the mistake of getting mad at God. Instead of find fault with Him, railing at Him, tell Him how unfair he is, questioning His judgment, His goodness, or His love for you, find a way to REJOICE in HIM. He’s not asking you to rejoice in your circumstance. He’s asking you to focus on and rejoice in the God of your salvation. Don’t cut yourself off from your power source. The end result of rejoicing is spiritual strength. After he speaks of rejoicing in verse 19 of chapter 3, Habakkuk immediately writes, “The Sovereign Lord is my strength.” If you will give God the response He wants, rejoicing in Him, He will respond by giving you His supernatural strength. The strength of God enables you to move forward with courage when you are overwhelmed with adversity. When your world falls apart, you may feel weak, but rejoicing in God will get your focus off your circumstances, and He will fill you with His strength, enabling you to persevere. You’ll be able to endure the situation valiantly. The prophet, Nehemiah, said it best in Nehemiah 8:10: “The joy of the LORD is your strength.” Therefore, if you want to be strong, do as Paul commanded and, “Rejoice in the Lord always” (Philippians 4:4). God gets glory when we handle the situation properly. Habakkuk writes in verse 19, “He makes my feet like the feet of a deer, he enables me to tread on the heights.” This represents two things: 1) the Lord will enable you to rise above extremely difficult circumstances, and 2) He will promote you spiritually. The strength that God imparts will enable you to climb the mountain you are facing. When you get to the “mountaintop” and you are spiritually promoted, you will be in clear sight for the world to see. Jesus said in Matthew 15:5, “A city set on a hill cannot be hidden.” Therefore, He will get glory when you handle the situation as He prescribes in His Word. When everything falls apart, God is indeed up to something good, and promotion and elevation are on the way. So when things appear to be falling apart, don’t fret or fear. God knows exactly what He’s doing. He is setting you up for promotion, and He will ultimately show you an awesome display of His glory and power. You will be able to rise above your situation and do exploits through the power of the Holy Spirit that you never thought you could do. All you have to do is to trust God, adjust your perception, and rejoice in Him in spite of it all. What lessons did you learn when everything fell apart? Please leave a comment below. Photo courtesy of tiverylucky via freedigitalphotos.net.